I love the Findus books... they're enormously inventive, funny and charming. My grandchildren love them too. There was once a man called Pettson who had a cat named Findus. They lived in a little red house with a tool shed, a hen house, a woodshed and a garden. Paddocks lay all around, and beyond them was the forest. 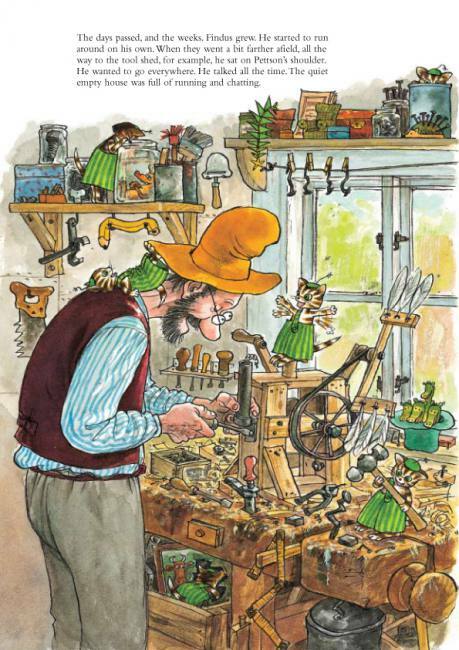 This is the third story from Gecko Press about one of Sweden’s most popular characters, the quirky and forgetful Farmer Pettson and his curious talking cat, Findus. Farmer Pettson tells the story of when Findus was little and came to live with him, and how he lost him and found him again. It is a charming, warm and funny story with typical Sven Nordqvist detail in the story and in the pictures. These books have sold four million copies in 40 countries and been translated into over 20 languages, including Russian, Hindi, Faroese, Basque and Vietnamese. … although young listeners are likely to be entranced, the combination of detailed illustrations and a longer, slightly more sophisticated read make this an ideal offering for older children who still enjoy a good picture book. The text tells the story of how old man Pettson is given a kitten to keep him company, and how one day, the kitten, Findus, disappears when he is frightened by a badger. A simple read-aloud, you think? Think again. The pictures are packed with visual jokes and unlikely goings-on. Pictures on Pettson’s wall tell parallel stories of bovine life on the farm, Pettson’s chickens drink tea out of tiny cups and fall asleep with boredom when he talks about the family photos. And look at Pettson’s bedside cabinet – why is it on skis? What on earth has he put in his glass of water? Is that egg-time alarm clock meant to be for cat-naps? And is the palm-tree bedside lamp Pettson’s own crazy invention? The kitten is named after the brand-name on the box that he arrives in, and the whole story is told on the front cover, if only you could sort it out. This is a very clever book that could give the inquiring youngster hours of fun. 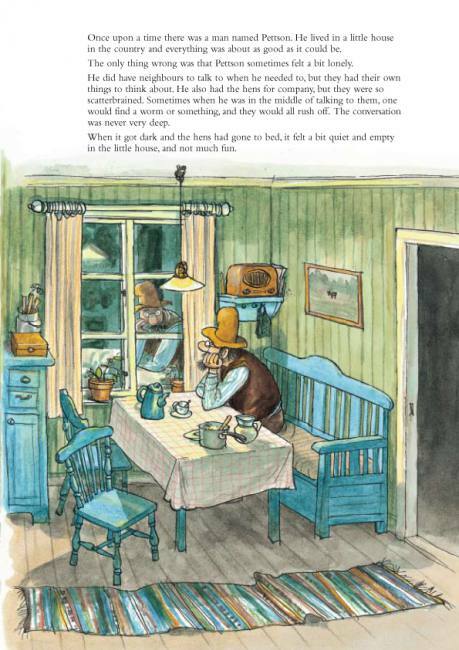 When Findus was Little and Disappeared, another warm look at farm life, makes a good starting place for children unfamiliar with Sven Nordqvist’s hugely popular stories about Swedish farmer Pettson and his talking cat, Findus. This is the tale of how the two met. There’s a lot of text to every page, but it’s engaging enough that even quite small children will stay focussed, especially since the pictures are so rich with detail. There is something Where’s Wallyish about When Findus was Little and Disappeared. It’s an exquisitely illustrated children’s book, and another jewel in the crown of Wellington’s Gecko Press, the third it has published by Sven Nordqvist. Nordqvist is one of Sweden’s more popular illustrators. His big drawings are appealingly detailed, with lots of busy goings-on on each page. They are funny, and full of places for young minds to explore. The story is one of love and loss, and told simply. A lonely old man, Pettson, gets a kitten for company. The kitten, Findus, gets into mischief and gets lost. Pettson goes spare looking for Findus. The kitten is found, and everyone is happy. The publisher recommends this book for five-year-olds and above, but it could equally engage and delight younger children. There’s scope for lots of reader-listener interaction here, and much fun to be had. Another tale featuring Pettson and Findus, his cat, this is about how, when Findus first came to live with Pettson, he disappeared. Featuring a talking cat, this is a strange tale that is involved and has a lengthy storyline; competent readers should be able to manage it on their own. 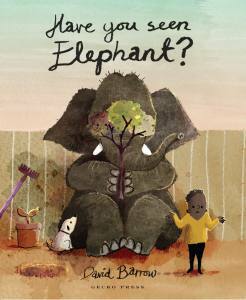 Younger ones will need an adult’s help, but all ages should enjoy the gorgeous illustrations. kitten. He set out exploring outdoors only to be frightened by a badger before Pettson finally managed to rescue him. Great pictures will keep little readers entertained throughout the story. Probably more suited to older children for independent reading as the text is in a quite small typeface and is a bit complex for young readers. 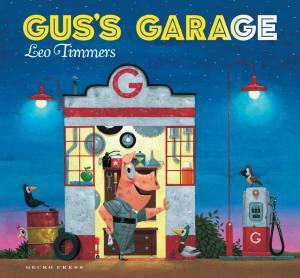 It works well as a read aloud story for younger children. In this, the third book in the series to be translated by Gecko Press about Pettson and his cat Findus, we read about what happened when Findus first came to live on the farm and how one day he disappeared. Wonderfully inventive illustrations with many details to examine and a longer than usual story for books in this genre. Another in the series about old man Pettson and his cat Findus. Children love to hear stories about when they were little, and just like them, Findus wants Pettson to tell him about when he was a tiny kitten and disappeared. The story goes right back to when Pettson’s neighbour Bertha suggested that he needed a wife. `A whole wife would be too much,’ says Pettson, `but a cat wouldn’t be such a nuisance.’ And so Findus comes into his life. They make great friends of course, but one day Findus goes adventuring and is frightened by a badger. Pettson has to do a lot of searching before he can find him. These stories have a good amount of text, making them excellent to share with an older child, while the vibrant illustrations are full of the detail of everyday life, with plenty of interest to make repeat readings worthwhile. Personally, I found this book cute and funny… I especially liked the illustrations. It’s about a cat named Findus and his owner, old man Pettson. Findus gets his owner to tell him about what happened when he was little and disappeared. This book recounts that story with the aid of some hilarious illustrations. We learn about when Findus spoke his first words as a kitten, when he said ‘I’d like some of those trousers’. Farmer Pettson just stared at him. Findus had spoken his first words! I loved how much imagination went into this book, particularly in the fact that old man Pettson and Findus actually talk to each other. I also liked that Findus is a cat, and a really cute one at that! This is the third Pettson and Findus book published by Gecko Press. The series is so popular in its original Swedish, it has been adapted for TV, film and theatre. Old Farmer Pettson’s cat Findus asks to hear the story of how he disappeared. ‘You haven’t disappeared; you’re right here,’ said Pettson. ‘I mean when I was little,’ said Findus. So Pettson tells the story of how he lost Findus when he was a kitten and first came to live with him. The story is inventive, funny and charming and will be loved by children and also by their parents and grandparents. This book is about a little cat named Findus, who was given as a gift to Pettson. Pettson was an old man who lived alone until he had Findus enter his life. One morning Findus went to explore the house and garden when he saw a badger. When Pettson woke up Findus was gone and the house was quiet. Pettson gets worried and goes to find Findus. We like this book because it has very good illustrations and is a really nice story. This story would be good for ages 3+. We would recommend this book for a quick read or as a bedtime story. Reviewed by Rachel Pilois, aged 12, and Jenny Burke, aged 11. `Tell me again,’ said Findus. Farmer Pettson tells the story of Findus when he was a kitten (perfectly summarised in the title) which forms a precursor to The Fox Hunt (2006) and Pancakes for Findus (2007). Farmer Pettson is lonely but doesn’t feel able to take a wife. Findus soon makes himself at home in the glorious clutter of Pettson’s farmhouse and workshop. Pettson feels the kitten is safer indoors. He reads to him and Findus begins to talk. Then one morning Findus is missing. He has gone outside and been frightened by a great hairy monster. Pettson searches in panic until the pair are reunited. Then he finds a way to make sure that Findus the cat is never frightened again. We find out more about the strange little critters who share Pettson’s home and also learn where Findus’s green striped trousers came from. Even without the illustrations this is a heart-warming story about friendship. The author’s remarkable colour pictures, however, add whole layers of fun to the events, and offer extra rewards to those who study the witty details hidden in every cluttered corner. When Findus was Little and Disappeared was first published in Swedish in 2001 by Opal A.B. in Stockholm, and was translated into English by Julia Marshall. This is another delightful story from the pen of Sven Nordqvist about eccentric farmer Pettson and his unusual cat Findus. This one tells the story of how Pettson came to have Findus and what happened one day when Findus disappeared as a kitten. The illustrations in this book are humorous and entertaining, drawn with surprising detail, enabling readers to spot unusual things that are sometimes part of the story and sometimes aren’t. 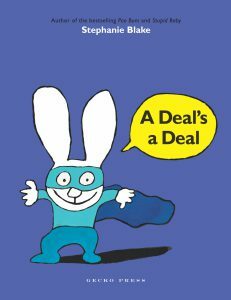 The story itself is as entertaining and humorous as the illustrations, giving the book wide appeal. It is easy to see why Sven Nordqvist’s Pettson and Findus books have sold over four million copies in more than 40 countries. Full of zany details in the illustrations, this is an offbeat Swedish classic from Gecko Press.